Caption slip reads: "Photographer: Gaze. Date: 1952-07-10. Reporter: Gaze. Assignment: Salvation Army Camp Redondo. 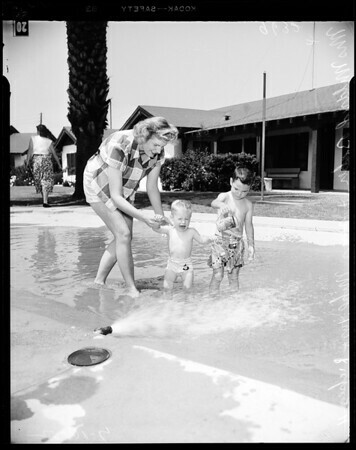 20: Mrs. Mildred Baker of Redondo takes her two boys, unhappy Mike, 1, and Rickey, 4, wading in pool at Salvation Army's Redondo Beach summer camp. 30: First to enter wading pool at Salvation Army's Redondo Beach summer camp as season opened today were Ginger Bourbeau 2 1/2, of Maywood, and Rickey Baker 4, of Redondo. 29/41/42: Terry Jones, 2, of Santa Monica, has his hands full with the familyl luggage upon arrival at the Salvation Army's Redondo Beach summer camp. 19/35/36: (back to camera in two shots is Joanne Messina, 5) on suitcases are Pamela (PJ) Plowman, 3, of South Gate, meeting one of her neighbors-for-a-week, Johnny Messina, 4, of Los Angeles".